Tami Hulm grew up on a farm in rural North Dakota. She joined the Firm in 2004 and works in the area of family law with Attorney Suzanne M. Schweigert. In 2007, Tami passed the Certified Paralegal examination, earning her the designation of CP, and she passed the Advanced Paralegal Certification examination, earning the additional designation of ACP with specialties in Trial Practice (2007) and Family Law – Dissolution Case Management (2017). 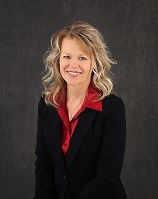 Tami is a member of the Western Dakota Association of Legal Assistants (WDALA) where she has served as 1st V.P. (2005 – 2008) and 2nd V.P. (2015-2016), and is also a member of the National Association of Legal Assistants (NALA). Tami uses her experience and compassion to help families in transition by providing support to the attorneys and clients. She is involved in each case from beginning to end, beginning with scheduling the initial consultation and ending with the finalization of the case. Tami drafts pleadings, letters, e-mail correspondence, and schedules calls and meetings. She is integral in preparing for all hearings and trials. Tami and her husband, Jim, reside in Bismarck. In her personal time, she enjoys traveling, being active outdoors and spending time with family and friends.